The 4th H for Health Challenge was created by Healthy Kids Out of School, an initiative of ChildObesity180 at Tufts University Friedman School. The challenge encourages physical activity and healthy eating habits at 4-H club meetings. 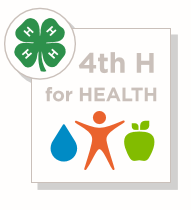 Ohio 4-H went a step further and added social and emotional health to the challenge. The tracking sheet and other resources can be found in the Ohio Leader's Packet and Curriculum. Questions? Contact Katie Riemenschneider at riemenschneider.13@osu.edu.